Granat for RO 90/DX 93 Sanders 80 Grit, 50 pk. Festool 497392 - Granat for RO 90/DX 93 Sanders 80 Grit, 50 pk. Introducing Festool's all new Granat abrasive, one that we have come to refer to as the "Ultimate Abrasive," due in no small part to its amazing versatility. Though originally designed for use on solvent-based, high-VOC surfaces (volatile organic compounds) and hard surface paints, its anti-clogging properties are well suited for a much broader range of applications. Use Granat not only for sanding and finishing clear coats, plastics, mineral-based surfaces, solid surface materials and acrylics, but also for wood, composites, or just about any other surface type. A hardened aluminum oxide abrasive with ceramic grit and stearate coating, Granat is available in grits ranging from 40 to 500 for Festool Sanders, and from 120 to 800 in perforated roll form. A broad assortment of pack quantities are available. The all-new Granat abrasive by Festool is a ceramic-grain coated abrasive material that was developed specifically for commercial applications in the industrial paint and woodworking industries. What's different about the Festool Granat abrasive? Well, depending on the application, Granat can easily deliver anywhere from five to ten times the life of standard aluminum oxide abrasives! The Granat abrasive's performance is nothing short of AMAZING! 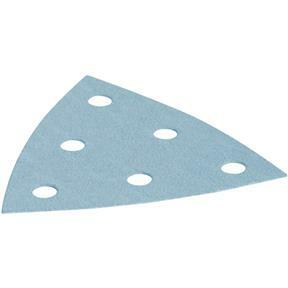 The open-coat application of ceramic particles to the backing material resists clogging and extends the overall life of the abrasive well beyond what you could normally expect from more conventional abrasives. We decided to see how Festool's Granat abrasive would perform in the shop or on the jobsite. And, according to the tests we performed, these super-sharp ceramic abrasive particles cut through our test material very quickly, but without burning the workpieces. We subjected the new Festool Granat ceramic abrasive to some truly brutal tests and they came through with flying colors on all fronts! Yes, they're a bit more costly than aluminum oxide abrasives but they're well worth it!